12 gorgeous and timeless red Roses delivered to your loved one in a beautiful presentation box makes this the ideal gesture to show your love and affection.If you would like to make your flower gift extra special, we suggest adding a Box of Chocolates to your order. We have 3 to choose from; Standard, Premium, Superior. Easy ordering. Good quality flowers. Delivery was prompt. The driver left the flowers in the shade & rang me to let me know they were delivered. Presentation was excellent...my wife adored them. Service was great, I would recommend without hesitation. The delivery was excellent--timely and trouble free. However, the product was less than I expected. 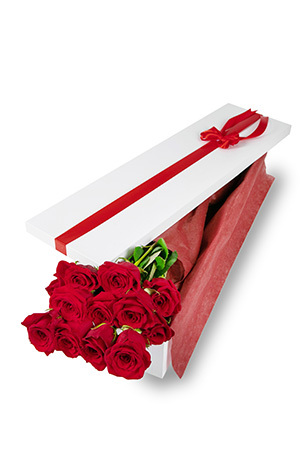 I had imagined that the boxed roses would be boxed long-stem roses, and I thought the teddy bear would be somewhat larger. Overall, I don't feel the order had a good price-to-value ratio.